Pre-dehydrated food processor? Non-functional sinks installed purely for style? A streamlined... baby? When it comes to midcentury visions of tomorrow, sometimes it's hard to tell the spoofs from the earnest predictions. But what's even more interesting is why the parodies popped up in the first place. Back in the 1940s, designers promised Americans that once the second World War ended, a brave new world of design would open up. But as we looked at recently, there was a very calculated effort to dial back expectations once it was clear that so many of these promises couldn't be fulfilled. Even internally, some firms were making fun of the absurd claims being made about what life would be like after the war. The illustration above, from an industrial design firm in Ohio, was credited to "the Office Boy of the Schaible Company" and notes that it was "quietly submitted." Right off the bat, we see that everything is "automatic" and "run by electric controls" — a perfected vision of tomorrow, or at least a parody of one. A few features: Everything automatic, run by electric controls (No. 1) in operator's booth. Everything in easy reach of Giant Whirling Faucet Unit (2). Floor no longer of use, becomes Giant Cup-Strainer (3). For kitchen-swimming, drop cup-strainer floor, fill kitchen with water, snap diving board (4) in place. Escalator (5) to operator's booth. Multi-use flit gun (6) controls various pests, including persistent salesmen. Mood-control keyboard (7) creates any frame of mind desired. Self-rocking rocket cradle (8) for streamlined baby of "tomorrow" (9). Conveyor belt (10) with "meals of tomorrow" and newly-designed "plates of tomorrow" on way from shelf to places at uncomfortable "seats of tomorrow". Place (11) for a few kitchen antiques saved for sentimental reasons. Mechanical "reachers" (12) for performing one or two little kitchen details not quite perfected yet for automatic operation by electronics. 105 millimeter twin-spouts (13) made of glass. Streamlined sinks (14) put in just to help room look a little like a kitchen. Sinks completely useless otherwise. Packaged powdered dust (15) that turns into pre-dehydrated food. Shows "seeds" for a year's supply of food. "Flowers of tomorrow" (16) show influence of streamlining. Chemical garden (17) "raises" pre-dehydrated fruits, vegetables and fish. Hopper just below it sifts food from chemicals, fast-freezes it, and makes it into capsule meals. Electronic stove burners (18) for old-fashioned people wanting occasional hot meal. Windows (19) with one-way vision for privacy. Neighbor's house built around kitchen like this (20). And so forth, etc., etc., etc. Grim, isn't it? 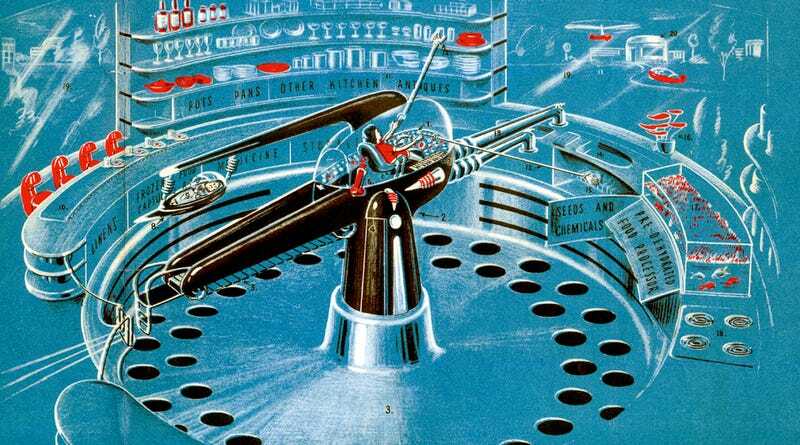 The interesting thing is that while this illustration is clearly over-the-top, many of the futuristic visions presented are firmly grounded in the promises of the time. Kitchen antiques "saved for sentimental reasons"? That was a promise for our meal-pill future that dates back to at least the 1920s. In the future, who will need plates? Nobody. But you'll surely save the fine china to tell your kids about how strange and backwards life used to be in the before times.